“Nothing good happens after 2 AM”–but apparently very, very good things happen after 5 AM. Let me tell you about these cookies: the dough, which bakes up soft and chewy but lightly crispy-edged, is based on my favorite chocolate chip cookie recipe. 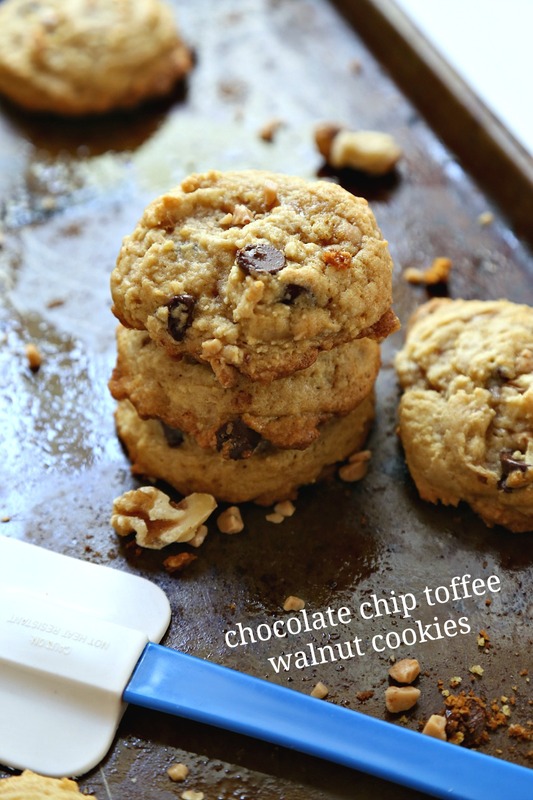 I didn’t feel like making plain old chocolate chip cookies though–go big or go home at 5 AM, I say–so I decided to throw in a generous stash of walnuts and toffee alongside the chocolate chunks before folding it all into the fluffy dough. 5 AM baking, guys. It’s totally worth the half-exasperated, half-“omg is this what it’s like to date a baker” bleary look that your significant other will give you when s/he trundles into the kitchen amidst your banging pans and mixing bowls. Trust me on this one. What’s your favorite time of the day/night to bake? 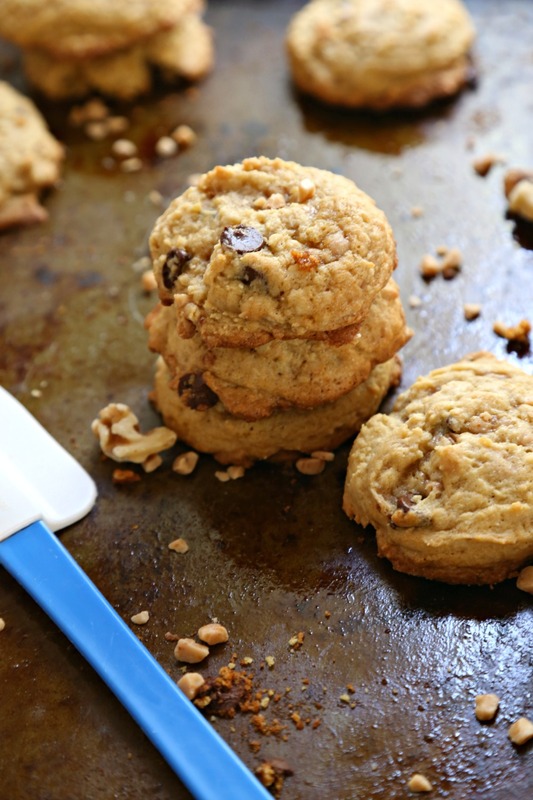 This recipe takes your basic chocolate chip cookie to the next level! With a soft, chewy, and lightly crispy-edged base, these cookies are filled with chocolate chips, toffee bits, and walnuts. The perfect loaded treat for those cookie exchanges (and every other occasion!). In a large mixing bowl, beat together butter and both sugars until light and fluffy. Add flour, cornstarch, baking soda, cinnamon (optional), and salt. Stir into wet ingredients until just incorporated. Gently fold in chocolate chips, toffee chips, and walnuts. After your dough has chilled: Preheat oven to 350 degrees F. Lightly grease a cookie sheet. Drop 1-inch balls of dough about 2 inches apart on prepared cookie sheet. Bake in preheated oven for 9-11 minutes, until outside has just set (light golden brown). 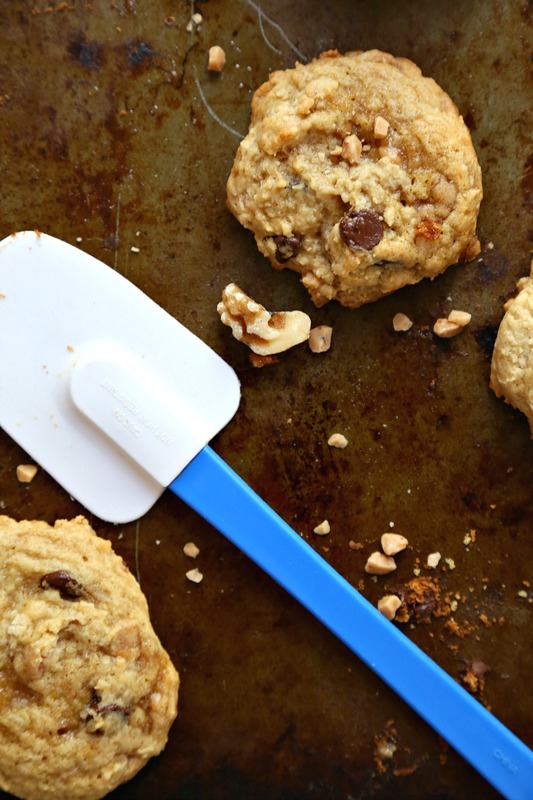 Allow cookies to finish cooling on stovetop before serving. They’re a pretty cool bunch of cucumbers 😉 yesss to the toffee, Liz! I’m an afternoon baker, nothing better than pulling buttery warm choc chip toffee walnut cookies from the oven and washing down with a tall glass of icy cold milk. Yarm! I am so impressed with your early morning shenannagans, I cannot remember the last time I was awake at that hour, let alone considered eating, cooking or shopping. You are amazing. Wish we lived closer. ooooh, as the sunlight streams through the open window? Yes, LOVE! And yes, someone clearly put us in the wrong hemispheres…! I can’s say I’ve been grocery shopping at 4 am recently, but It just might be worth it to have a few of these scrumptious cookies! 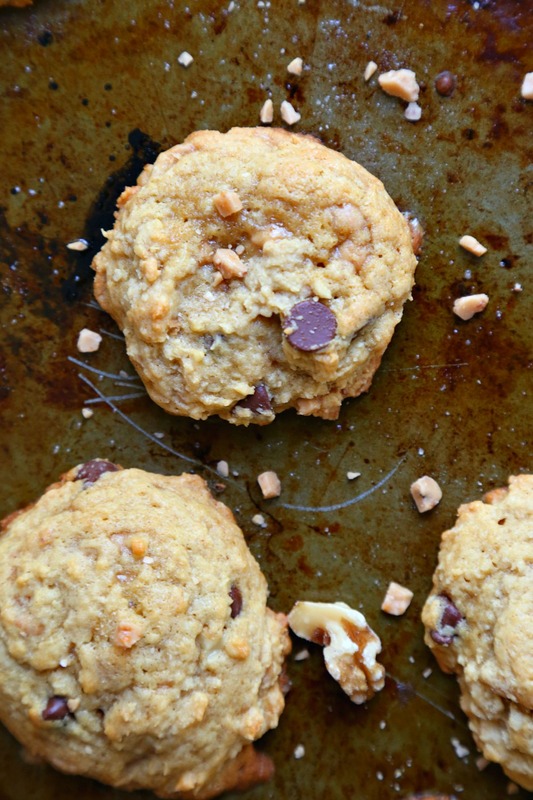 Those toffee bits paired with chocolate chips sound amazing! Ha! Well thankfully, I’m sure you can manage without the 4 AM run. But definitely say yes to the toffee! haha! Yes, I imagine us singing “Good Morning” from “Singin’ in the Rain” while consuming these. Girl, the Safeway two blocks away from me is open 24 hours a day so you best believe I’ve made some late runs there. Sometimes you just gotta do it. omg the number of late-night Safeway runs I used to make….I miss those!! Would totally join you on one, ya know. I loved these cookies!!! They were perfect for my busy day 🙂 Thank you! !